Wow! Nothing negative to C here, all positive. AA terrific share, thankyou for keeping us in the eneloop. You can never B too cautious with smoke alarms. If you’re in charge of smoke detector maintenance get your hands on Ds. These are free, so there could be an alkaline, please remain calm, the last thing we need is a charge or assault and battery. Wow! Nothing negative to C here, all positive. AA terrific share, thank you for keeping us in the eneloop. You can never B too cautious with smoke alarms. If you’re in charge of smoke detector maintenance get your hands on Ds. These are free, so there could be an alkaline, please remain calm, the last thing we need is a charge or assault and battery. Yes. It's 2019. Father is now parent and mother is now also parent. I'm here from /r/punpatrol and I have a warrant for your arrest. I see that you've managed to take the Li-ion's share of the upvotes for this post. The next challenge: 3LR12 (4.5-volt), D, C, AA, AAA, AAAA, A23 (12-volt), PP3 (9-volt), CR2032 (3-volt), and LR44 batteries (& no B type). Showing $2 for me, although could vary based on location. See here. just threw my old one away…. How is the quality of these batteries though? I am on yr 3 of my Duracells. Not sure if it's worth it. I use 9v lithium batteries in mine. 10 year shelf life, they've been in the alarm for 6 years and still test good. After 10 years the whole alarm should be changed anyway. hve used these for a few years. The ones in the hardwired units get through the year but the battery only units see 8-9 months. Just make sure there's nobody sleeping at home when you take the batteries for the swap, in case of a fire. How will they beep without a battery? @turbodude: We have two smoke alarms at home. One deiced to pick a Sunday long weekend and the other decided to do it in the middle of the night. The chirping for hours drove me batty! Word of advice keep a 9V spare! Time to go around the house and scrounge up all the 9v batteries. Online guide to replace the batteries. In WA I think these need to be hard wired in and not battery powered? would also have a battery backup. In Australia, hard wired and battery backup. Been that way since 1995? On new build and major returns. Only for newer places. I think it only applies to old houses when you go to sell. in WA there is an exemption to this rule. You are allowed to install a sealed 10 year long life battery smoke alarm under certain exemptions to the law. The problem with these smoke alarms is the chirping won't stop until you get an electrician in to replace the smoke alarm. Cant argue with free. These sadly don't make it through the year anymore (on the battery only detectors). The article says it'll happen in Battery World Gawler, which is located in Adelaide (only). It seems it is not in any Battery World. There is no B. W. Gawler in Syndey. 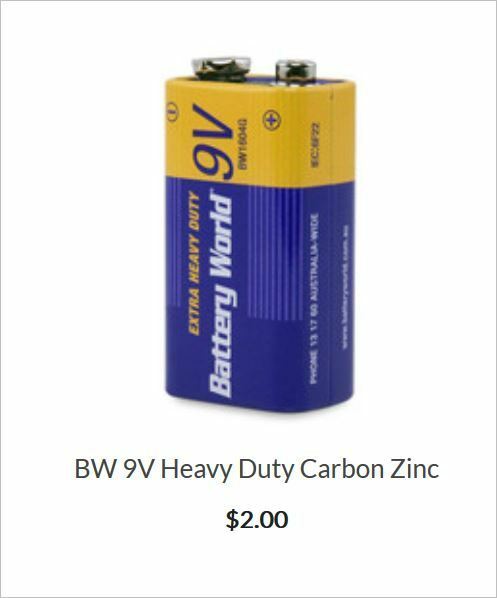 Battery World Gawler is not located in Adelaide. Even 80Km. And also have expansive and expen$ive Harbour Views. Trust me, I am a Real Estate consultant (not!). Sure, I get no one is going to give out free alkalines, but I'm not putting leaky-prone-crap in a set-and-forget safety device. Carbon Zink (heavy duty) are ideal for smoke alarms. They will last 12 months and correctly operate the low battery warning beep for at least a week before the battery dies. Actually Zinc Carbon are 'general' use batteries. Heavy Duty / Super Heavy Duty are Zinc Chloride. Am i going to be told that out of stock in the early morning on Sat? shoppe on 21/03/2019 - 17:30 Comment score below threshold (-10). KaptnKaos on 21/03/2019 - 18:04 Comment score below threshold (0). Quote: "It's a straight one-for-one replacement". Not quite, my old battery is an alkaline. Zinc batteries must be replaced every year due to its shelf life. My apologies for misrepresentation. There was no will intention on my part, especially after stating the type of replacement battery in the OP. Is this one of those things that they do to be nice to pensioners, poor people etc but if 10000 people Rock up for free batteries they will never do again? Not suggesting it would get abused (I figured I would take at least one 9V down just to see what it's about and to get a carbon-zinc battery just to see what it behaves like as almost all 9v here are alkaline.. I've always wondered if BW actually can derive revenue from conventional batteries being recycled by simply having enough volume (e.g. tonnes of the stuff) that otherwise makes it uneconomical ? unlike lead-acid batteries where you can usually get something, even it's a couple of dollars for a suitable sized battery from a recycler..
Will the Morphett Vale store be doing this? Any chance of a rain check? I'm away then but would like to do my Dads, In-laws, old lady neighbour, and Sons places. $2 for your store but not in every location. If you the pick Morphett Vale store they are $1. Just checked my local Vic store and they are participating in this promotion. Rang Burleigh (Kortum Drive) in GOld Coast and they are participating. Just checked both my batteries. They are fine. Our smoke detectors are direct powered, so the battery is only a back up. Duracell. I thought you needed Alkaline for smoke alarms? Zinc batteries are good for low power draw appliances like smoke alarms. Thanks OP. Picked up 1. Someone else grabbed 2. She had to fill in a details sheet. I managed not to have to do that. What qs are in the detail sheet? And do ya gotta bring smoke alarm aswell? Or just the Battery? Just need the battery. I think they wanted email address. The guy wasn't fussed. Swapped 8 over. No details and very easy! Brought 7, they only let me swap 5, they kept the 7 batteries. Swapped 2. All easily done in South Melbourne. They were very nice and didn't make me fill forms or anything. Barbarians don't need smoke alarms. By the time there's smoke, the damage has been done. Swapped 16, they were surprised, said what are you changing the whole neighbourhood. Guys were completely friendly, and put the batteries in a cute little batteryworld wheelie bin. Total good deal, will try to do them good in future. Yeah are you doing all your families smoke detectors. Yeah the promotion will make me think about going back there next time. There was a cute little 9V battery and led torch there for $7.95. Also a lot of other battery related items.